When you ride, the only contact with the road is your tyres. This is why it is so important that you look after them and look out for signs of wear. You might be surprised to learn that the contact patch on your average car is just 147 square inches (373sq cm) of rubber. A motorbike has substantially less as it has only two tyres and because the rounded shape leaves oval contact patches rather than squares for a car. This reduces braking and cornering grip. Therefore, it is essential to know when your bike needs new tyres! You may have just picked up your new or pre-owned motorbike and are excited about riding it. But have you checked how old the tyres are? The letters and numbers on the sides of tyres provide a lot of information about sizing and performance, but also date of manufacture. 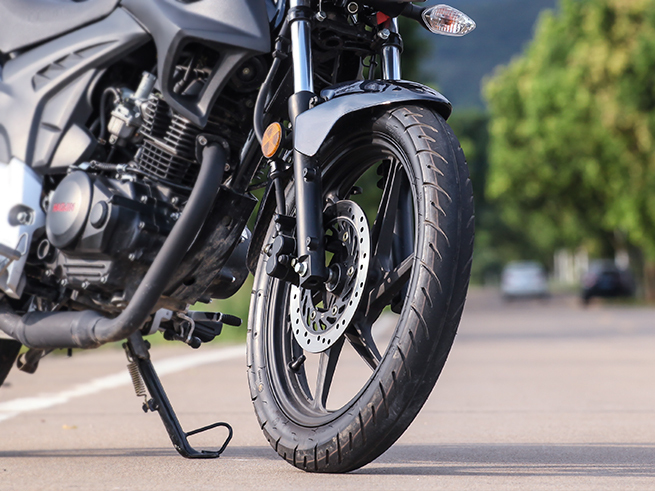 Motorcycle manufacturers specify that all tyres over five years old should be checked, regardless of how much tread they have left. At 10 years old they should be replaced even if the tread is like new. The reason for this is that the tyre compound hardens over time, diminishing grip which relies on a softness in the compound. You can tell a tyre is ageing by the presence of small cracks or crazing. The tread on your tyres is designed to push water away, improving grip in even the worst conditions. As soon as this tread starts to wear you’ll lose some of the grip and the bike will become more dangerous to ride. Once the tread is worn below the legal limit of 1.5mm then you must change them. There are wear indicators on the tyres that show how close you are getting to this level. You can also use a tread depth checker to monitor the rate at which your tread disappears. But this does not mean you need to wait until it reaches this depth. If you ride your bike hard or often ride in the wet, you should consider changing them at 2.5mm. If it gets to the point where you can feel that your bike is not gripping the road properly then you know you have to change your tyres. By this stage you have probably left it longer than you should have. Other telltale signs are vague steering and slight handlebar wobbles as you ride over white lines on the road. A brand new tyre can get a nail in it causing a slow leak. Check your tyre pressures weekly to see if there is any loss of pressure. If your bike has been sitting idle for a long time in the garage it can develop flat spots in the tyres which distorts them and can cause high-speed tank-slappers. You need to inspect your bike’s tyres regularly to ensure they are in good condition. If anything appears amiss, you should replace the tyre. It is your safety you are thinking about.